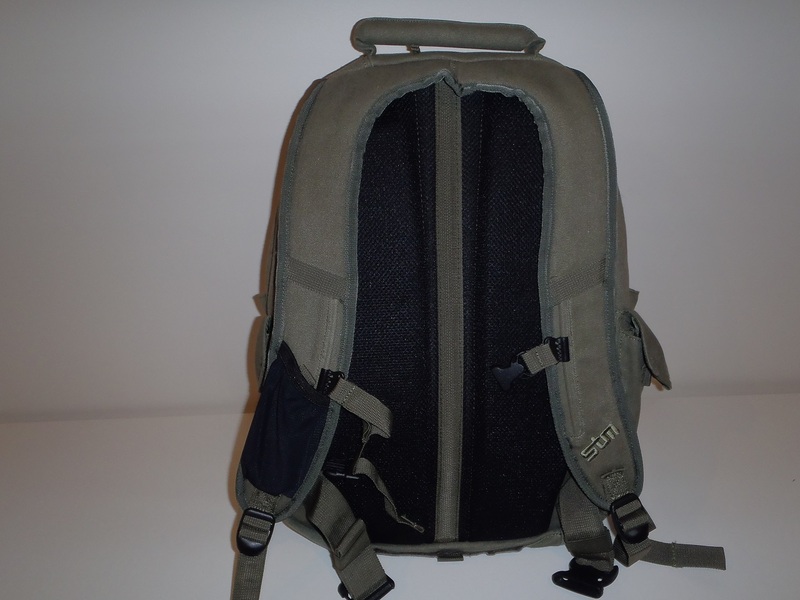 In addition to the STM velo laptop shoulder bag that we reviewed in March, we also had the opportunity to get an STM Convoy medium laptop backpack as well – courtesy of our friends at STM. We receive emails on a number of topics here. The subject can range from offers of cheap Viagra and access unclaimed riches through to product advice and feedback from our articles. 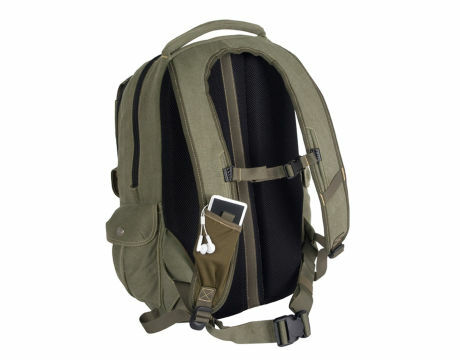 A few months ago, a bloke (we assume) calling himself “Chad” asked us about the “DayZ backpack from STM”. We hadn’t really paid a lot of attention to STM so we investigated further and found the backpack Chad was referring to – the ‘Convoy’. 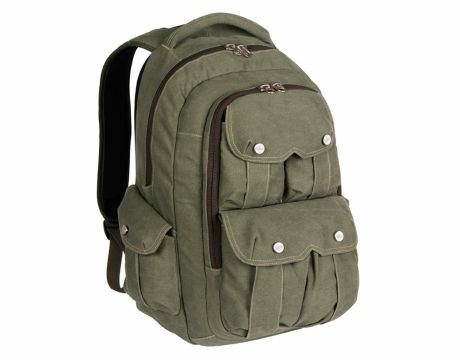 It’s a solid looking bag in olive green and we can see the resemblance. We reached out to STM and they were kind enough to send us a sample for review. World travel wasn’t on the cards this month but I did have some domestic overnight business trips during the review period to run the Convoy through its paces. For a business traveller, the Convoy is probably overkill in most situations but for overnight trips I found it perfect. Looking back to my university days, the Convoy would have been perfect. Easy access, concealed laptop section keeps your notebook protected, safe and secure Accessing the contents in the main compartment couldn’t be easier – just unzip. 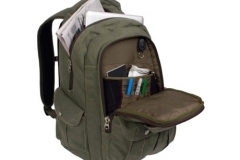 The concealed section is good in that it keeps a laptop separated from the rest of the main compartment in a way that is not obvious. If you were to open the Convoy to get an item out, the person sitting next to you wouldn’t see your laptop so it is concealed from immediate view. We see the real value of this concealed compartment as a way of stopping a laptop from rattling around in a bag with so much space inside. Main compartment for books, paperwork and reading materials There is plenty of room in the main compartment for books or other gear. When travelling, I was able to fit 2 shirts, an after hours change of clothes and a wash kit for an overnight trip for work. This made the check-in process at the airport an absolute dream because I didn’t have to wait for the baggage carousel or manage 2 bags. Organisational panel for cords, drives, pens, etc. In comparison to the velo, there are less places to tuck things away but the front pocket will keep your bits and pieces organised. 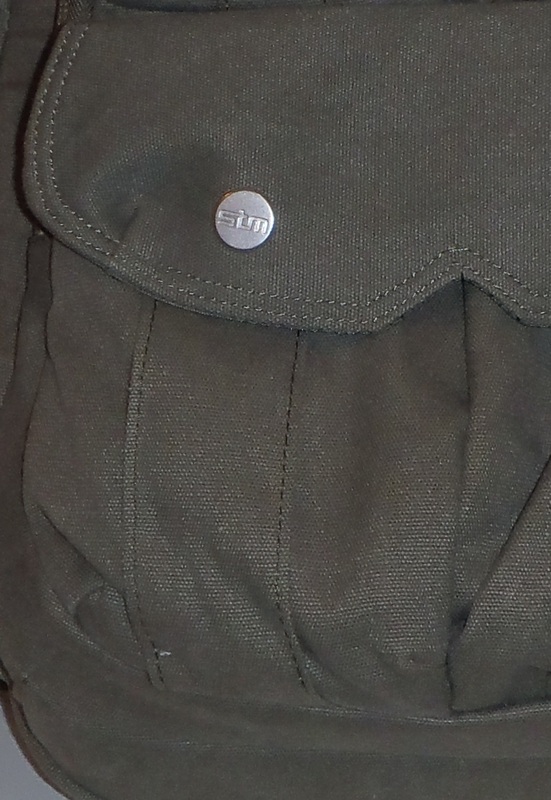 STM also have a detachable key ring in here as well – nice touch. Adjustable suspension system for a comfortable fit over the long haul with sternum strap Without question, the harness setup on the Convoy is both strong and comfortable. It took less than 5 minutes to adjust to fit me 100% and when fully loaded, the way the weight is distributed makes it feel lighter than it should. Tuck-away waist straps to stabilise the load I’m not a fan of these for reasons of vanity but when you use it, I had to admit that the strap makes it more comfortable to carry the bag for extended periods of time. 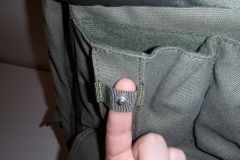 There is enough flex and stretch in the strap to be snug but not restrictive. Integrated phone pocket on shoulder strap for easy access When you look at this pocket, it really doesn’t appear to be big enough to fit an iPhone, more like a 5th Generation iPod nano. The pocket stretches though – and we were able to fit our iPhone 4S into it. There is almost no chance that the phone will fall out because of the tight elastic at the top of the pouch but we’d be worried out how vulnerable a glass faced smart phone would be to getting knocked and damaged when being carried this way, simply because of where the pouch is. 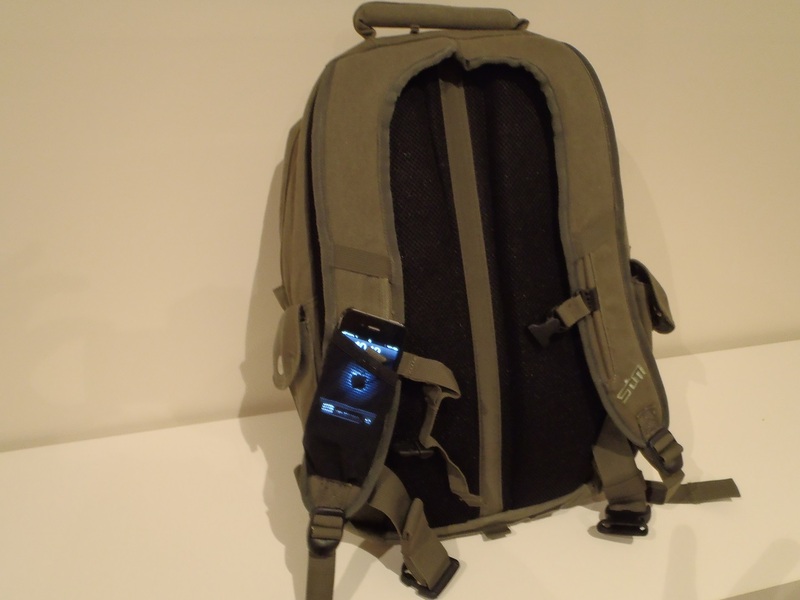 Personally, I wouldn’t think twice about dropping my ipod nano in this pouch and it would be easy to access but I’m more likely to leave my phone in my pocket. Tuck-away rain cover for any unexpected downpour This feature is brilliant, although maybe not exactly a fashion statement when you have it deployed.. The waterproof cover will keep the rain off the Convoy during a downpour, meaning that if you ride a bike or need to endure an unexpected bout of rain, the contents of your bag will stay dry – which is kind of important when the contents include a laptop. In my experience, an umbrella seldom covers my backpack as well as the rest of me. Based in Melbourne, I managed to test this out during the ‘road test’ and found it to be highly effective at keeping the Convoy and everything inside very dry. 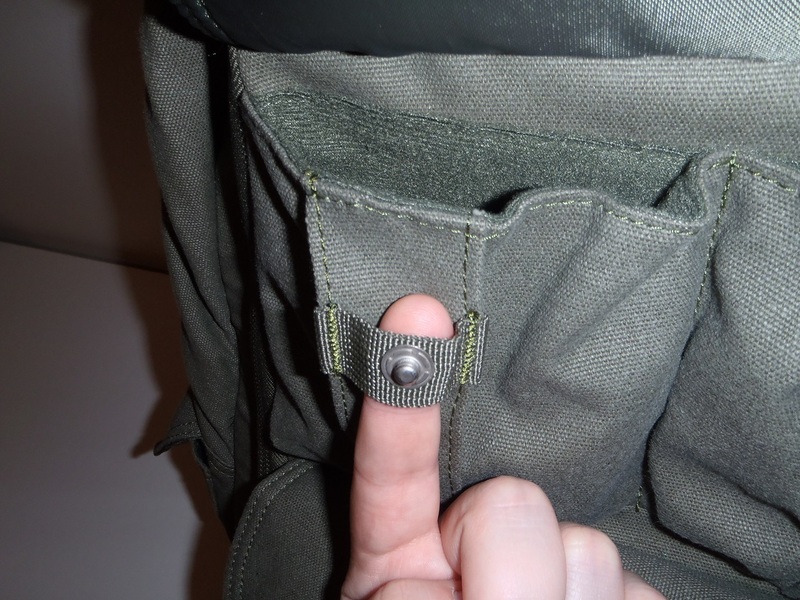 When folded away in the pocket at the base of the bag, the rain cover also acts as extra padding for when you put the bag down a little harder than you should. Front utility pockets for glasses, iPod and cords, drives, etc. 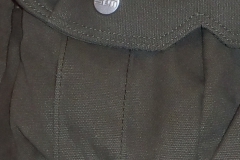 These pockets are secured with press studs which look rigged and really fit in with the theme of the Convoy. Each Press studd has the STM branding engraved on it.Generally I’m not a fan of press studs because in order to close them you have to .. well.. press them shut. The idea of keeping my sunglasses in a pocket that I need to press a stud to close didn’t thrill me but thankfully the designers at STM considered this und the under receiver of the press stud is on a loop of fabric that means you can get a finger under it to pinch it shut really easily – making it one of my favourite features of the product, especially after a 6 week road test. 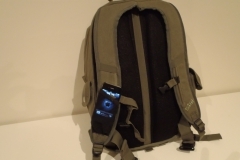 The top 2 pockets are lined with a soft liner for sunglasses, iPods, smart phones etc and the bottom pocket is a larger double pocket the has the water resistant lining. Two versatile side pockets (for newspaper, bottle, umbrella…) Just like the front pockets but in a different spot and perfect for 600ml water bottles or a small compact umbrella. I didn’t end up needing these during the road test but they will hold a water bottle – so long as you don’t need to clip it shut. Fits most 15″ laptops Although I used my 13″ MacBook Air in this bag, I did check it out with a Dell Studio 15″ laptop for size and it fit without issue. I don’t like anyone’s chances of getting a 17″ in there but most people should be right with a 15″ laptop. We found the Convoy online for $149.95 but in-store prices may vary. I was able to comfortably accommodate the items below in the Convoy with space available in most of the external pockets. Make no mistake, this bag holds heaps. With the payload below, I still had room for more odds and ends. 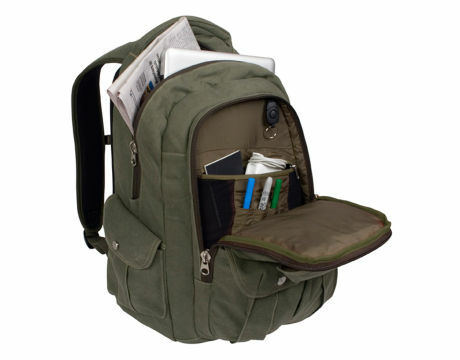 For me, it was the little things that made the Convoy stand out from other laptop backpacks I’ve seen previously. Where was the convoy when I was a full time student? 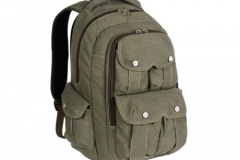 This is one of the best made and most comfortable backpacks I’ve seen. 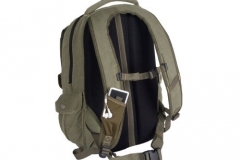 It isn’t an obvious “laptop bag” and whilst the concealed section does hide your tech cargo from view, the best thing about it is that it divides the contents of your bag. In comparison to the velo, for the everyday business commute the Convoy is likely to be overkill. For overnight trips, the Convoy is great. 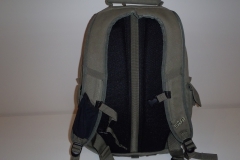 If you travel “light” like I do, this product is likely to hold all your stuff in a bag that fits easily in an aircraft overhead compartment and is both easy to carry and comfortable to shoulder. STM has been a real find for us and we’d like to thank Chad for bringing them to our attention – everyone hates “buyer’s remorse” so we like to recognise companies that highly value quality in their manufacturing process. The amount of thought that has gone into this product and the Velo also needs to be acknowledged – it really is a shame that these bags are not more widely available in retail stores. If you want to check STM gear out in person, have a look at your local JB HiFi or apple reseller.